Winning the Europa League is now Manchester United's "easiest route" into next season's Champions League, according to manager Louis van Gaal. Saturday's 2-1 defeat at Sunderland means United remain six points adrift of the Premier League top four. 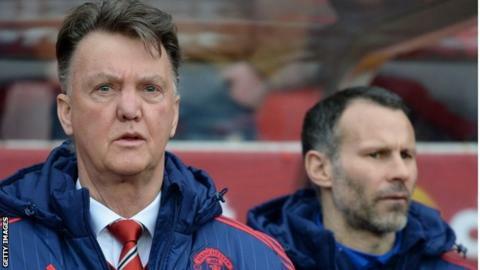 Asked afterwards if United can still make the Champions League places, Van Gaal said: "It will be very difficult. "After this match, the Europa League is our best route but it will not be easy because there are so many good teams." Since last season, the winners of the Europa League have been rewarded with a place in either the Champions League final qualifying stage or the group stage. United play the first leg of their Europa League last-32 tie against Danish side FC Midtjylland on Thursday. They play Shrewsbury in the FA Cup next weekend and do not return to Premier League action until 28 February when they play third-placed Arsenal at Old Trafford. Van Gaal says he has not given up hope of matching United's fourth-place finish from his first campaign in charge, but has warned his squad that it now looks unlikely. "We have given five points away against Chelsea and now Sunderland, so it is too much at this time," he added. "I have said that also to the players, because you cannot close your eyes to it. It is still possible but the Europa League is easier I think. "It is also not so easy, because there is also a fantastic level in that competition, so we will have to fight for it."